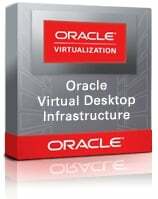 Oracle has released an update to its Virtual Desktop Infrastructure, better known to one and all as VDI. Version 3.3 adds support for Oracle Linux, a tricked-out admin portal, and – at least according to Larry & Co. – improved performance. VDI 3.3 is but the latest step on the long and winding "network computer" road. Oracle coined that term back in the mid-1990s – and it's still trying to make money off the idea, this time through its Sun Microsystems acquisition and a revival of the NC idea as envisioned in VDI server clusters that stream running PC images down to thin clients. Oracle didn't just get Sun Ray thin clients when it bought Sun, it also got Sun's Solaris-based VDI software for hosting PC images on the network. Sun engineered a couple of different ways of lashing thin clients to servers over the years, but the current stack of VDI software – which was initially based on VMware's ESX Server hypervisor for x86 and x64 servers – made its debut in September 2007. Sun did a second rev of its VDI stack in March 2008, still using VMware's hypervisor as the backbone serving up virtualized Solaris or Linux desktops to thin clients, laptops, or clunky old PCs that were effectively dumb tubes. That 2008 release was a month after Sun bought desktop hypervisor maker Innotek, a German software company that got its start building a hypervisor for IBM's OS/2 operating system and expanded it out to cover just about all the operating systems you can think of. We now know this effort as VirtualBox, one of the open source projects that Oracle has more or less left alone since acquiring Sun in January 2010. Before that acquisition, Sun launched VDI 3.0, and allowed VirtualBox to be an alternative hypervisor for serving up virtual PC slices. And although VirtualBox has become tightly integrated with the VDI stack, Oracle added support for Microsoft's Hyper-V hypervisor in the VDI 3.1 release, and is still giving customers a hypervisorial choice – just like Citrix Systems does with its XenDesktop VDI stack. VirtualBox is not a bare-metal (type 1) server-virtualization hypervisor, but rather a hosted (type 2) hypervisor – one that requires an operating system underneath it. In releases 3.0, 3.1, and 3.2 of the Sun/Oracle VDI stack, Solaris 10 – and specifically the x86/x64 version of Solaris 10 – had to be that foundation operating system. But with the Oracle VDI 3.3 stack released on Wednesday, companies can deploy the VDI software atop Oracle Linux 5.5 if they so choose. This is not trivial. Oracle VDI is not just a hypervisor that stores virtual PC images and runs them on server iron. It also includes a session-management layer (including a MySQL database to store PC configuration data and links to Active Directory or LDAP for user authentication) as well as Sun Ray session management and RDP client management software out on the desktop access layer. All three had to be ported to Oracle Linux, which is itself a clone of Red Hat Enterprise Linux. In addition to supporting Oracle Linux 5.5 on the host servers, Oracle is now supporting the latest releases of Solaris, Windows, and Linux as guest operating systems on virtual PC slices. In its announcement, Oracle gave a special shout-out to Canonical's Ubuntu 11.04, but clearly other Linuxes and a slew of Windows variants are supported, as well. The VDI stack also has a full-lockdown kiosk mode that allows for browser-based applications to run, but doesn't allow any access to underlying guest operating system functions. Oracle says that it has optimized Windows Media Player to work better with its VDI stack when supporting Windows XP and Windows Server 2003 – though it's a bit puzzling as to why the latter is important. Also tweaked is Sun Ray's Appliance Link Protocol (ALP), now tuned to dynamically optimize audio channels down to virtualized PCs and to cut network bandwidth by as much as 92 per cent for streaming audio. Oracle is making use of asynchronous I/O in server hypervsiors to even out the performance of virtual PCs, and has added a capping function to VMs that keeps a PC image from hogging CPU, memory, storage, or I/O resources. Oracle recommends a reasonably peppy server for hosting virtual PCs, of course. If you choose ESX Server or Hyper-V as your virtualization layer in the VDI 3.3 stack, you can deploy Windows XP, Windows Vista, or Windows 7 on those virtual PCs. If you want Windows 2000 SP4, Oracle Linux 5.5, Ubuntu Linux 9.04, 10.04, or 11.04, or SUSE Linux Desktop 11, you'll need to have VirtualBox as the hypervisor layer in the VDI stack. Oracle is also very keen on customers using its Sun Storage 7000 disk arrays to hold the PC images, and in fact you have to use these arrays if you want to deploy VirtualBox or Hyper-V as the virtualization layer. One other important thing: Any Oracle applications, regardless of heritage of vintage, that runs in a Web browser is certified to work over the VDI 3.3 stack. A perpetual user license to Oracle VDI 3.3 costs $150 per named user or per Sun Ray device, with support another $33 per year. You can also license the software at $30 per year, plus the annual support fee. Oracle also announced another bit of software today: a freebie client for Apple's iPad and iPad 2 fondleslabs. 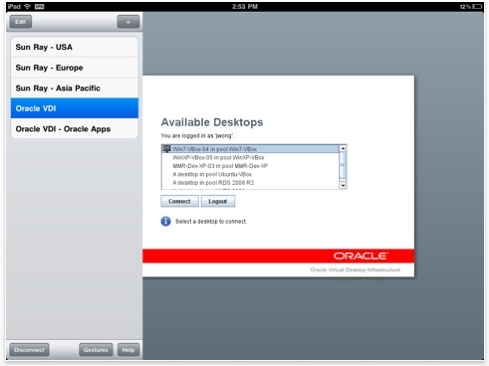 The sign-on screen for the Oracle iPad client – pure visual excitement, eh?